On March 26, 2019, Justice Michael P. Boggs is presenting “Criminal Justice Reform in Georgia” as a segment of the Crime and Punishment in the 21st Century Lecture Series, sponsored by the Department of Criminal Justice and Criminology and the Campus Life Enrichment Committee. 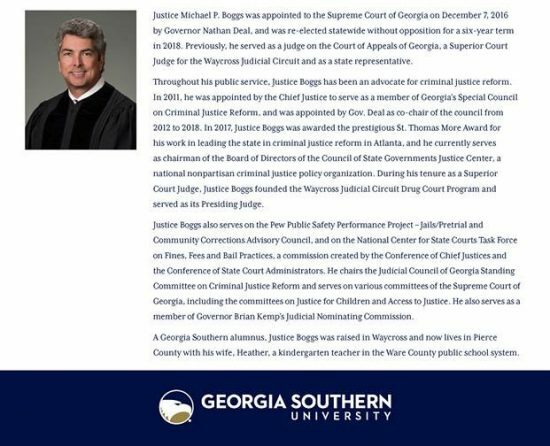 Justice Boggs was appointed to the Supreme Court of Georgia on December 7, 2016 by Governor Nathan Deal, and was re-elected statewide without opposition for a six-year term in 2018. Previously, he served as a judge on the Court of Appeals of Georgia, a Superior Court Judge for Waycross Judicial Circuit and as a state representative. Please join us on the STATESBORO CAMPUS in Russell Union 2080, MARCH 26, 2019 at 10 AM.